August 27, 2013: The 21st IUHPE World Conference on health promotion commenced in Pattaya, Thailand on August 25. Jointly hosted by the International Union of Health Promotion and Education (IUHPE) and Thaihealth, the four day conference focuses on “The best investments in health promotion”. 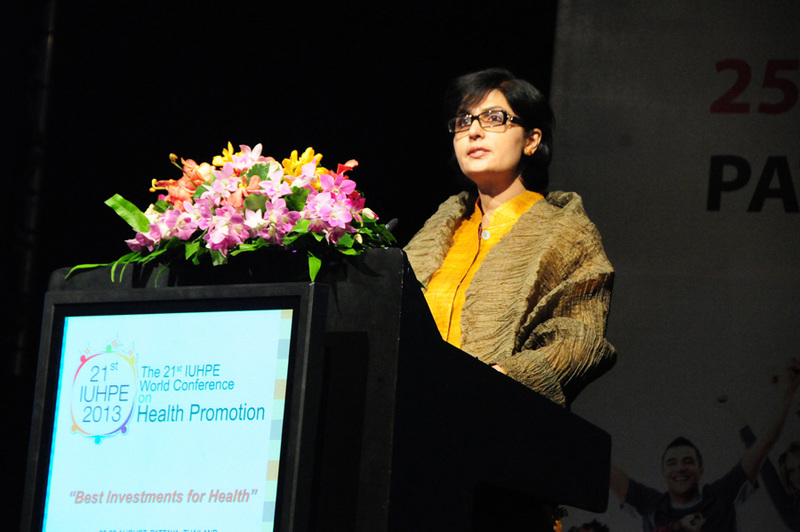 Our President, Dr. Sania Nishtar, gave the keynote speech at the opening of the event. Michael Sparks, President of the IUHPE, termed the keynote speech as “the perfect start to a conference on investing well in health: clear and inspiring“. The text of this speech can be accessed here. Lying in a surgical unit of the Khyber Teaching Hospital in Peshawar is an elderly woman with half her abdominal wall practically eaten away by infection – the outcome of a surgery carried out in a district hospital, which was mismanaged in the first place and became infected later. She has several gaping openings, through which the insides of her abdomen and muscular tissue can be seen. For those who have the stomach for such sights, I have posted the picture on my website (www.heartfile.org). Surgeons in Peshawar are patiently treating her but give a guarded prognosis. Such patients, bearing the insignia of surgical malpractices, are usual at Pakistan’s teaching hospitals all over the country. Most suffer at the hands of quacks, imposter doctors and others that are bona fide in ‘degree’ but not in ‘practice’. Although there is no dearth of these ‘doctors’ in cities, it is the rural areas that serve as havens for them. This unfortunate woman is an illustration of policy failings on the part of successive governments to tackle a long-ignored critical policy imperative – healthcare quality regulation. To set the frame of reference, regulation is the government’s tool to impose needed constraints. In the health sector, it can be relevant to health services, medical education, human resources, food quality, medicines and related technologies. Here, the context is regulation of healthcare service delivery, where three regulatory considerations come into play – authorisation to establish facilities, output-based control of prices and ensuring compliance with quality standards. The issue being discussed here relates to the latter. Over the last 65 years, successive governments in Pakistan have focused largely on infrastructure and programmes as far as health service delivery is concerned. There has practically been no focus on regulation in the health sector. Today, if a citizen wants to even put up a banner on a street or a kiosk on the roadside, a number of permissions need to be solicited from various government offices with necessary diligence. But when it comes to healthcare and people’s lives, anyone can open ‘shop’ anywhere and start prescribing and cutting – no form of treatment is regulated from a quality standpoint. Different provinces have, at various points in time, developed institutional structures such as health regulatory authorities. In most cases, the emphasis has been on creating the structure, enacting legislation, and convening boards but neither with vision and strategy nor with strong implementing arrangements to enforce meaningful action. As a result, nothing is functioning effectively and most have either been fleeting arrangements or the responsible institution has, over time, significantly deviated from its mission. As a consequence, millions of Pakistanis receive healthcare they don’t need or which can cause harm. The lady’s inflicted gaping surgical wounds are one illustration of malpractice, which manifests in individual suffering. There are other malpractices that put populations at risk. Pakistan today is called the ‘cirrhotic state’ (a form of liver failure) because decades of needle reuse by quacks has enabled viral hepatitis to flourish relentlessly. In some cases, entire populations of villages test hepatitis positive. To cite another example, misuse of antibiotics and resulting antibiotic resistance is not just leading to poor infection control and high healthcare costs, but also threatening a return to the pre-antibiotic era with implications transcending our national borders. Promotion of quality healthcare in a health system is a demand and supply equation. Low demand is partly the result of lack of awareness about quality and entitlements and limited knowledge about the available remedies under the existing law of torts, which is evidenced by the low frequency of court claims in tort. Development of case law in this area has also been slow. Although the Supreme Court has reiterated the need to develop this area of law – the case of Punjab Road Transport Corporation vs Zahida Afzal and others being illustrative – and has articulated the standard of care to be provided (Alia Tareen vs Aman Ullah Khan, advocate [PLD 2005 Supreme Court 99]), it has not focused on the subject through its characteristic judicial activism approach, which today is a harbinger of change in Pakistan. On the supply side, the solution of the problem is not to create traditional regulatory authorities. We are aware that these fall prey to the command and control style of regulation, with administrative controls and enforcement of sanctions through onsite inspections – a style of regulation that is fraught with rent seeking, as is also evidenced by experiences in drug regulation. A multi-pronged approach has to be adopted, ranging from development of standards and guidelines, capacity building to foster compliance with stated norms, and institutionalising punitive approaches where necessary, amongst other things. At the barest minimum, provincial governments should focus on promoting adherence to prescribed guidelines in public hospitals, which notwithstanding their performance constraints – both in terms of management and patient care – are the last recourse for poor patients. Most governments focus on changes in healthcare through reform approaches for which they neither have the institutional capacity nor the policy tenure. As opposed to this, some straightforward quality promoting measures that have significant potential, especially when in partnership with professional associations, never receive attention. The more long-term reform-relevant approaches can incrementally ingrain incentives for better quality in healthcare through peer oversight and ‘market’ harnessing regulation. However, such approaches entail complex system change and require significant policy deviation from what is currently the norm. While perfectly plausible in Pakistan’s mixed health system, these measures require policy consistency overtime so that the needed institutional capacity can be developed. They can be successful only if insulated from policy vacillation, which is inherent to change in government. Perhaps the image of the woman can remind health sector decision-makers about the need to think on these terms, 65 years after the country’s creation.